A hidden gem that seems preserved from the mass tourism. Understand, when we speak about mass tourism, yes you will see plenty of tourist, locals and foreigners. But compare to other place, it is surprisingly clean, and no barriers around meaning no one has taken that “too close to the edge” selfie yet. 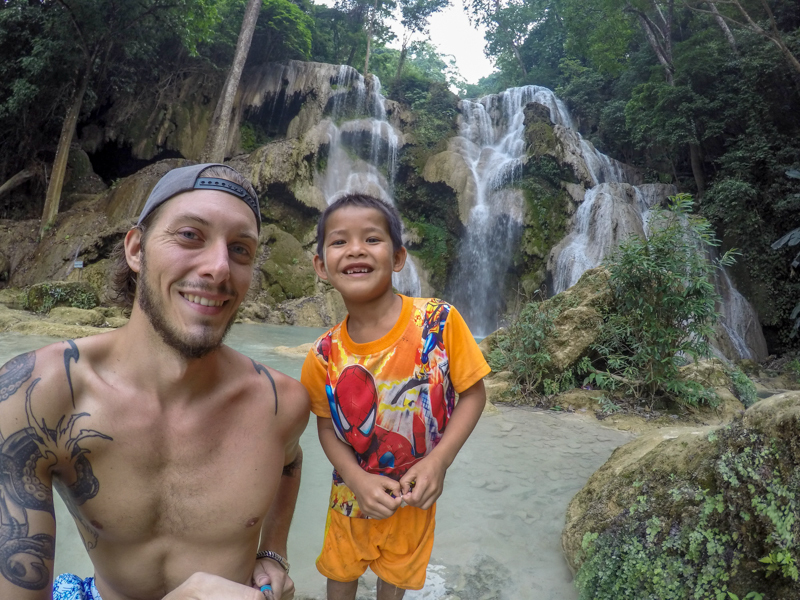 The dry season being the best time of the year, 25 Km from Luang Prabang is a Turquoise Waterfall. The road is well paved and allow you to reach village you never could before. Be careful on the small old bridge with two large beams and use all your balance skill. We rented a scooter for the day at Sok Dee Guesthouse for 100 KK. Another possibility is to take a Tuk-Tuk, which will cost you more or less 150 KK / 18 $ for half a day. Trust me, you won’t have any problem to find one, dozens of them are all around town and willing to take you there day and night. For the solo travellers, bargain or a price and tell the driver you want to wait for more people, he will walk along and ask people to join the ride. When you leave Luang Prabang for your day trip, think about getting some food and drinks, you never know what can happen on Laotian roads. 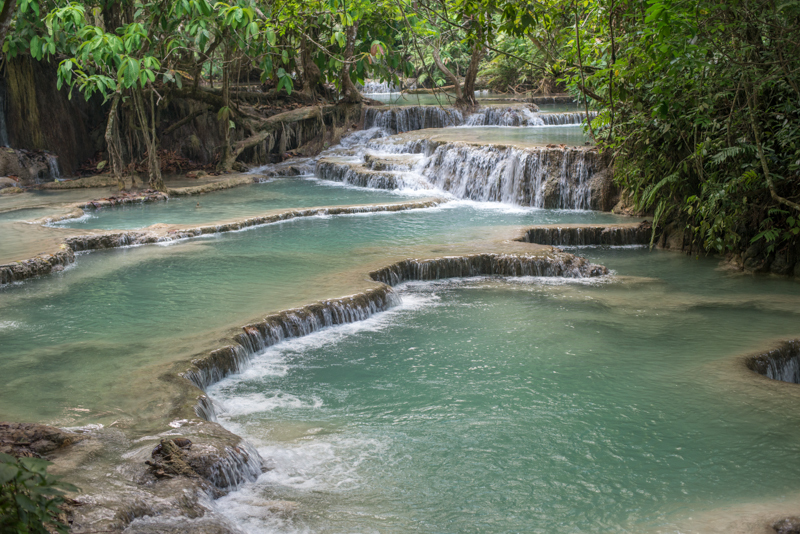 Driving past the Laotian countryside, through rice paddies and beautiful suroundings, make the experience even better. The sun takes a while to come out and clear the fog in Luang Prabang. So no need to be there by 8 AM, you will have the all place for yourself, but there would be no sun and no proper light for photos. Don’t miss Kuang Si Rescue Centre at the beginning of the path to the Falls on the right side. Asian black bears (Moon Bear) were saved from poachers and can now start a better life. The biggest threat to Moon Bear is still deforestation by reducing the habitat. They are also targeted by poachers for their gall bladders. Most of the 20 bears enjoying a new life were once a “bile bear”. Caged to harvest their bill, illegal hunter chase them down for traditional Chinese medicinal trade. A catheter is inserted in the Bear, harvesting 20 to 40 ml a day. Producing 2000 ml over a 5 year period, bile can worth 20.000 $ for per liter. Some are kept in that condition for over 20 years. Unskilled surgery, stress and ridiculously small cage lead to death in many instances. The more you walk the path along the “pool” and the bigger they get. The Falls seem endless as there are so many of them. We got tempted to stop on the way to take a dip, but decided to go all the way to the top. A lot of people were there already enjoying the bright blue water, only swimming in the marked pools as the others are either unsafe or considered sacred by the locals. A lot of website advise to take the right side up and then cross the falls at the top to go down the left side. I think we just saw a bridge, follow the track and went all the way up and down…. This side is meant to be slightly easier and the left side steeper with no stairs. In our opinion, there was no problem whatsoever, but we may not recommend this for the very young or elderly. The top offers a spectacular view of the valley. You will arrive in a flat area with water from all sides. Use rickety walkways to cross from one side to another. The very top of the fenced-in waterfall don’t really give you a great view of it. Fearless little fish that quickly come to your feet won’t do you any arm, people even pay to have them removed dead skin in Spa all around Asia. 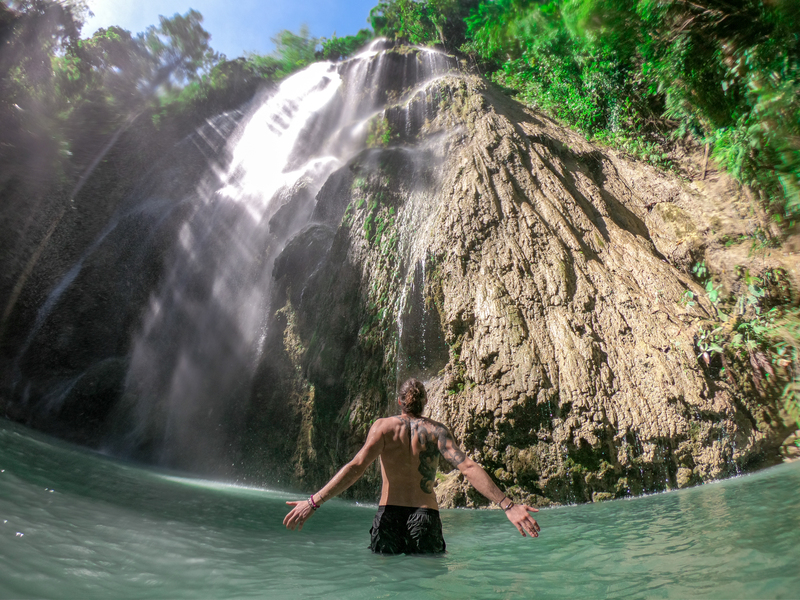 On the way back you can take a swim in the turquoise water of its travertine pools. Or, if you have enough and depending on what time it is, maybe, the crowd has left and it is time for you to unpack your tripod and take that photo which will be perfect once framed, next to your fireplace. And since a picture is worth a thousand words. Here is 3000. 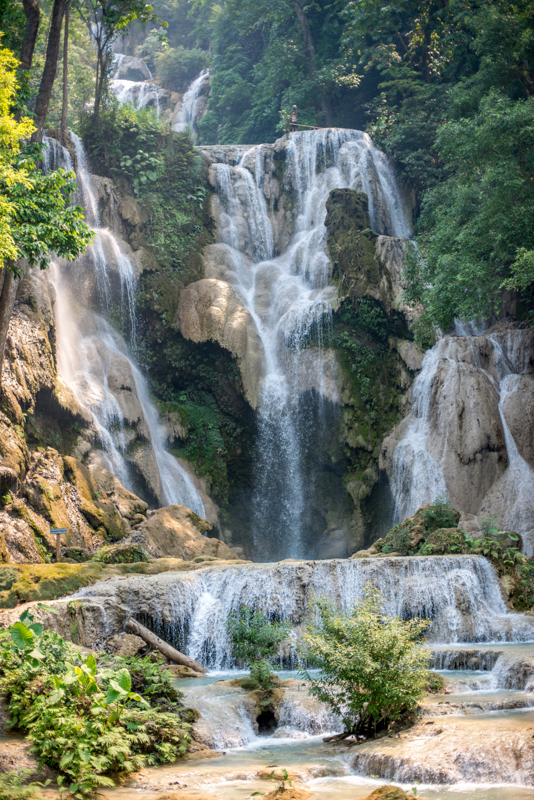 The Falls are located 25 km from Luang Prabang. Forty five minutes away by Tuk-Tuk, and should cost 200 KK for a full one, up to 6 people. The second option is to rent a scooter for 100 KK a day and go by yourself enjoying the scenery drive. If you feel fit enough, you can always get a bicycle and go on an adventure through paddy fields. Being open to the public from 7:30 AM until 5:30 PM, young children get in for free and adult should pay 20.000 Kips. Lighting is meant to be better in the morning for the best color. Take the path on the right side to reach the Bear Rescue Center. And then right from the waterfall to the top as it is meant to be more developed. Please, when climbing to the top, be really carefull as there is some really slippery section. People have already drowned here, sliding on the ground and hitting their head.